how do you "exhausted" in Hebrew? how do you “exhausted” in Hebrew? I’ve had one of those weeks that has at once flown by and seemed like an eternity. Know what I’m talking about? Lots of events, requiring me to be fully engaged in each… so the time flies really fast, but I also look back at last week and it seems as if it were ages ago. I’m feeling good… and exhausted. Perhaps you know the word עָיֵּף (ah-YEHF). That means tired. To say, exhausted, I and the male readers would use the word מוּתָש (moo-TAHSH), and the female readers would use מוּתֶשֶׁת (moo-TEH-sheht). I just realized that I wrote an entry on מותש a few weeks ago. I forgot – that’s how tired I am. So here’s a synonym in slang: גָּמוּר (gah-MOOR) or גְּמוּרָה (gmoo-RAH) – I’m finished. 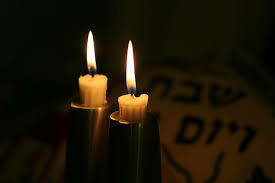 לָיְלָה טוֹב (LAH-ee-lah tohv) – good night. שַׁבָּת שָׁלוֹם (shah-BAHT shah-LOHM) – Sabbath of Peace! the quiet before the storm - how do you say "flotilla" in Hebrew? how do you say it in English?! how do you say "identity" in Hebrew?